Potent antitumor agent. DNA-topoisomerase inhibitor. 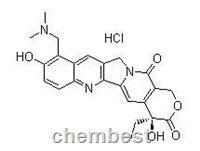 Analog of (S)-(+)-camptothecin,Used in chemotherapy of several different cancers.